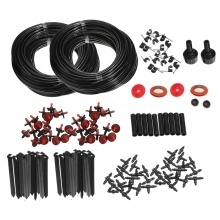 The automatic irrigation system kit can save water and energy for high-efficiency watering. It is ideal for hanging baskets, pot plants, flower beds, borders, greenhouses, etc. Auto watering system, it is good at watering plants and flowers. Cut the hose yourself, suit measures to local conditions with fixed stem, more applicable. Water plants with one turn of the tap. Slow and even watering promotes growth and does not disturb soil. Flexible tubing for easy installation.